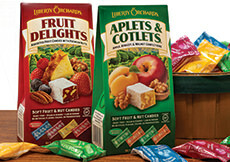 Our most popular fruit-and-nut flavors, ready to go! A thoughtful gift for busy families, and a great way to give yourself a lift anytime you're on the go. 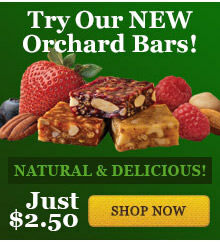 Our box of two dozen, fruity bars is great to have on hand for lunch boxes, snacks, or as a post-workout energy booster! Choose from our 24-count Assorted Box which contains 4 bars of each flavor or enjoy your favorite flavor by selecting a 24-count single-flavor box. Kosher. INGREDIENTS: Aplets Bar: sugar, corn syrup, walnuts, modified corn starch, pectin (pectin, disodium diphosphate, sodium polyphosphate, dextrose, dicalcium phosphate), natural flavors, apple juice concentrate, sodium citrate, citric acid, malic acid. ALLERGEN INFORMATION: May contain traces of peanuts and other nuts not listed in the ingredients. INGREDIENTS: Cotlets Bar: sugar, corn syrup, walnuts, modified corn starch, pectin (pectin, disodium diphosphate, sodium polyphosphate, dextrose, dicalcium phosphate), natural flavors, apricot juice concentrate, sodium citrate, citric acid, malic acid, soy lecithin. 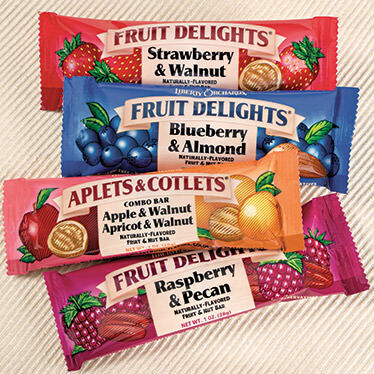 INGREDIENTS: Aplets & Cotlets Bar: sugar, corn syrup, walnuts, modified corn starch, fruit juice from concentrate (apple & apricot), pectin (pectin, disodium diphosphate, sodium polyphosphate, dextrose, dicalcium phosphate), natural flavors, sodium citrate, citric acid, malic acid, soy lecithin. INGREDIENTS: Raspberry Pecan Bar: sugar, corn syrup, pecans, modified corn starch, pectin (pectin, disodium diphosphate, sodium polyphosphate, dextrose, dicalcium phosphate), raspberry juice concentrate, natural flavors, raspberries, sodium citrate, citric acid, malic acid. INGREDIENTS: Strawberry Walnut Bar: sugar, corn syrup, walnuts, modified corn starch, pectin (pectin, disodium diphosphate, sodium polyphosphate, dextrose, dicalcium phosphate), strawberry juice concentrate, natural flavors, sodium citrate, citric acid, malic acid. INGREDIENTS: Blueberry Almond Bar: sugar, corn syrup, almonds, modified corn starch, pectin (pectin, disodium diphosphate, sodium polyphosphate, dextrose, dicalcium phosphate), blueberry juice concentrate, natural flavors, sodium citrate, citric acid, malic acid. have bought these for years in washington just bought them at red apple grocery store in selah washington for 2 for a dollar so thought i would order some from the web site they are allmost a dollar a bar why would the store be selling them much cheaper. My first taste of these handy snacks and i was hooked! The second taste showed how healthy they are. i have tried all of them but the raspberry. they are just fantastic. great to have on hand for that 3 P.M. slump. i especially like the orange ones. These bars taste really great! The only thing I didn't like is that they are a little too sweet for me other wise the flavor is great. Haven't had these for several years, but they're still the same delicious Aplet bars. A favorite in our family. We recently returned from visiting your factory. It was a very nice experience. I bought the plg. 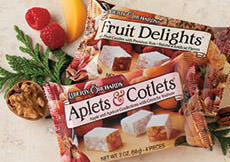 of 10 personal assorted bars of Aplets and Cotlets fruit delights. They are wonderful! Loved getting to slip them in my purse for snacking on the go!